Debuted with a striking collection simply called Jimen (The Ground) in 2011 and with two more books of poetry later, Sayaka Osaki (b. 1982, Japan) today is widely considered one of the finest Japanese poets of her generation. 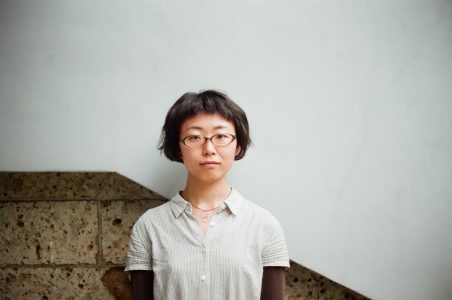 She first called people’s attention when she won the Eureka New Poet Prize in 2011, chosen by California-based Hiromi Ito, the most flamboyant and internationally conspicuous of Japanese woman poets. The year 2011 is very meaningful in Japan’s history as this was the year of the massive destruction caused by the Great East Japan Earthquake and following accidents at the Fukushima Daiichi nuclear power plant. Arguably the most serious collective trauma for the Japanese society since World War II, this experience largely dictated the direction that Osaki’s poetry would take. Slim but dense, her volumes of poetry Yubisasu koto ga dekinai (Pointing Impossible, 2014) and Atarashii sumika (New Dwelling, 2018) are filled with a tense sense of survival and struggle for life in the planetary context. With the former book, she was awarded the Nakahara Chuya Prize, the highest honor granted in Japan for an emerging poet. Language is the first disaster that humanity experiences. Language is the violence that we, as people, continue to experience every day. We experience this disaster, this violence, and still, babies, begin to speak, unable to keep quiet. They repeat somebody’s words just as they are, reproducing the form of someone else’s experience with disaster. As a result, I do not know where “this disaster” begins nor where it ends. (From “Noisy Animal” in Pointing Impossible, translated by Jeffrey Angles). In many of her poems the opposites become interchangeable or at least negotiable–life and death, presence and absence, inside and outside, humans and animals, sound and silence, past and future. Words form a navigable river where her writing self proceeds with a superb balancing act into the unknown and unknowable zone. She looks for a way out like a giant tortoise or a quiet room with an open window and no door. The room is yearning to go out of itself through the big window and this remains its enduring hope. Here you have ten pieces from Sayaka’s three collections, most of them published for the first time in Spanish. Now is the time to discover her free-wheeling poetics. You’ll be struck with its peculiar charm. Being featured in the journal Yuriika (Eureka) as one of the newest, rising stars of the Japanese poetic world in 2011, her 2nd collection of poetry “Yubisasukotoga dekinai (Pointing Impossible)” was awarded 19th Chuya-Nakahara Prize in 2014. The features of her works are known for the use of ordinary words and the myth-like vision of the world. In 2016 her first book for children “Hey leaf, where is your home?” was published. She also keeps producing diverse collaborative creation with other artists such as dancers, musicians, contemporary artists, and other poets, with her sense and body of “noisy animal”. She was invited to international poetry festivals in Lethuania (2015) and Ecuador (2017), and also to young writers meeting during the annual book fair in Cuba (2018). Some of her poems are translated into English, Spanish and Lithuanian.